Sacred Heart's 1st Annual Bonfire Declared a Success! A huge "Thank You" to Maureen Howard for organizing the parish bonfire this past Saturday. It was the perfect gathering for a rather cold Saturday night. All who attended reported sharing great fellowship, lots of laughs, and an impromptu scavenger hunt. Hopefully, we can make this a regular event. Great job, Maureen! A group of Scared Heart parishioners have been meeting with Ellen Weilbacher, from the Development Office of the Diocese, to explore the goals of our parish. At the October meeting, Sacred Heart was given the opportunity to partner with Mount Carmel Health. The group is exploring how this partnership could better help Sacred Heart meet the needs of parishioners and the surrounding community. The next meeting will beNovember 16, at 6:30 p.m., in Ryan Hall. All who attend Sacred Heart are welcome to come and join the conversation. Fr. Antonio and Fr. Lonzo are pleased to announce that Miss Agnes (Aggie) Howard has been hired as the secretary/bookkeeper for both St. John the Baptist and Sacred Heart Parishes. She began in her official capacity on October 1, 2015. We welcome Miss Howard as a new member of our Staff for both Parishes. This is an exciting week for American Catholics, and the entire nation, as we welcome Peter's successor to the United States. For information on His Holiness' trip, visit http://www.popefrancisvisit.com/official-final-schedule-of-pope-francis-u-s-visit-2015/ . Love Spaghetti? St. Joseph Montessori School has you covered! Our friends at SJMS will host their 2nd Annual Spaghetti Dinner this Friday, September 25, @ 4:00 pm – 7:00 pm. Ryan Hall will be transformed into an Italian Restaurant for family and friends to eat and enjoy time together. Take-out orders will be available as well! Next Parish Council Exploratory Meeting this Thursday! Sacred Heart Parishioners – A group of parishioners from Sacred Heart has begun meeting with Ellen Weilbacher, from the Development Office of the Diocese, to explore the identity and goals of our parish in order to begin the groundwork for a Parish Pastoral Council. There have been two successful meetings thus far. The next meeting is scheduled for 6:30 p.m. on September 24, in Ryan Hall. It is not necessary to have attended the previous meetings to come. All who attend Sacred Heart are welcome to come and join the conversation. Sacred Heart's Annual Fundraiser Needs Volunteers. Volunteers are needed to help with Sacred Heart’s only major fund raiser, Italian Festival parking. The Festival is the weekend of October 9, 10 and 11. If you can help, please meet with Mary Rykowski in Ryan Hall after the 11:00 a.m. Mass. Our Business Manager, Susan Guy, has served Sacred Heart and St. John the Baptist for almost three years. Recently, she resigned from her position to pursue other opportunities. Susan will continue limited hours with us at least until the Italian Festival is over. We truly thank her for her years of service and dedication to our Parish, as she ably managed the business affairs of our Church. We also wish her abundant blessings in her future endeavors. May the Lord reward her for a job very well done. As she leaves, may she know our gratitude and heartfelt thanks. We are looking for parishioners who would be willing to, in one or two sentences, share why they attend Sacred Heart, and include those sentiments on various pages of our website, sacredheartchurchcolumbs.org. Your thoughts about our beloved parish will help visitors and prospective parishioners get a better sense of what we are all about. For more details, please see Dennis Jacob after Mass, or email him at denniswilliam27@gmail.com. As a pleasantly early update to last week’s notice regarding the hands on the statue of Our Lord above the main entrance, His hands were installed this past week. Recall that the originals were missing almost all fingers. Todd Bausch, who is also the painter responsible for all of the decorative interior paint work we have done the past few years, did a wonderful job with this restoration. Todd surprised us by including a bit of needed rhinoplasty on the statue as well. The cost of this project was $1500. Let us know what you think of the finished product. Last week Sacred Heart received a thank you letter from a grandmother who attended the Saturday Mass on August 8th, with her sister and granddaughter. They were from Kansas, Ohio and were headed to the Ohio State Fair after Mass. The problem was, they did not have directions to the fair and were struggling with their GPS. They were not sure what to do. Then, one of our parishioners not only gave them directions, but drove to the front gates of the fair leading the way for the visitors – making sure the three visitors made it to the fair safely! How wonderful! Celebrate Fr. Lonzo’s 10th Anniversary in the Priesthood! Our potluck on June 28th to mark the 10th anniversary of Fr.Lonzo's ordination, and welcome him to Sacred Heart, was a huge success. We had a good turnout, and the food was, as always, amazing. Fortunately, his mom and dad were able to attend, and we enjoyed meeting them. Thanks as always to our always dependable crew of potluck hosts; Rita, Aggie, Mary, and Susan. A few years ago when Fr. Lupa was here, he set up a small area in the vestibule for donations of canned goods for those in the parish that needed some help. It's a 'bring what you can, take what you need' system. As part of the effort to open up the vestibule, we have moved the pantry to the newly repaired and freshly painted (thanks, Wayne Miller!) closet in the vestibule. To work better in that space, if anyone has a tall, 4'-6', narrow set of shelves that are in good shape, we'd be happy to take it off your hands. A huge "Thank You" to all that turned out on a hot and sticky Saturday morning this past weekend. We accomplished allot, including weeding the flower beds around the church, planted three rose bushes around The Shrine, general cleanup, and adjusting of the downspouts. There's more to be done, but we got a great start. We also painted the carport, block walls behind the rectory and church, and the fence behind the chapel. 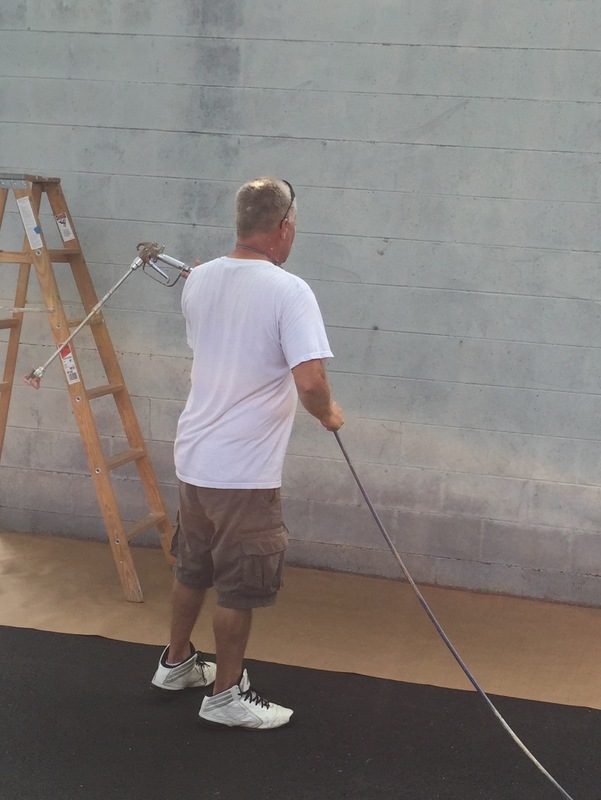 Thanks to Wayne Miller for his labor, painting expertise and painter's equipment, and Jim Merkling for buying the paint, pizza and soft drinks. If anyone was left off the following list of volunteers, please let us know. Father Lonzo, Susan Rorris and Will Rorris, Mary Rykowski, Dennis Jacob, Jim Merckling, Bob Longstreth, Wayne Miller and Dee Miller along with little Emilia, Bob Loraine, Paul and Linda Clutter, Gilda Cottrill, Chris Urban, and Patrick Durkin. These repairs are complete. The detail and joint repair on the limestone arch is finished, and the buttress caps were resealed. The West wall of the church was repaired an tuck pointed last year to stop water leaks and structural/cosmetic damage. While the South wall is not as bad as the West wall was, this needs to be addressed soon. As our Italian Village neighborhood experiences a renewal and rebirth, so must our church. To create a good first impression, and welcoming environment, we are repairing and freshening the Vestibule. The plaster needed attention before we can repaint. Gone is the gray paint scheme, and its dark, cold, somewhat institutional look. We have replicated the colors and decorative designs that are in the Chapel to create a warmer, welcoming feel, and tie this area in with the rest of the church. Phase I, the basic walls and ceiling, $3,000. Phase II, the detailed striping and design, will follow when funds, around $1,500, are available. The carpet in these three areas was in bad shape. Not only did it look bad, institutional, and dirty, but it was something of a trip hazard. For cost and time, we elected to re-carpet these areas. We think you will agree, it makes a huge improvement. To preserve the renowned acoustics of Sacred Heart, but improve broadcast of the spoken word, we think we’ve found a great Bose sound system. This was the one we tested the weekend of May 22nd. Details are still being worked out. Cost: $9,000. Completed June 29. We were able to negotiate a lower cost to replace all of the kneelers at once, enhancing the safety, comfort and quiet of the sanctuary. Be sure to read this Columbus Dispatch article, http://www.dispatch.com/content/stories/local/2015/04/30/Jubilee-Museum.html, and watch the video about the temporary/rotating exhibits at the Jubilee Museum, http://bit.ly/1JcYjUQ. Please visit this great community resource. Meets every Wednesday at 1:30 in the Chapel. Are offered in Ryan Hall after Mass every Sunday.